Then, against all odds, Lilac and Tarver find a strange blessing in the tragedy that has thrown them into each other's arms. Without the hope of a future together in their own world, they begin to wonder, would they be better off staying in this place forever? The Icarus is by far the most luxurious ship to come from the orbital dock. Boasting over fifty thousand people aboard, from the rich social heiress and media darling Lilac LaRoux, to the decorated war hero Major Tarver Merendsen, the general population of the ship taking the fastest route to their destination, to friends, family and the soldiers in the lower decks who are on their way to one of the colonies, to stop the latest rebellion. During a lavish party upon the ship, Tarver notices Lilac waiting for her traveling companions. A natural beauty that is as cruel as she is unobtainable. But Lilac can't be seen enjoying the company of a backwater boy, even if he is a decorated soldier. Being an only child of an overprotective father means Lilac's social interactions are limited. She's the heiress to LaRoux Industries and the wealthiest girl in the galaxy, but Major Merendsen doesn't seem to know who she is. A strange shudder begins to roll throughout the decks, bouts of passengers being spacesick has never been seen before on a luxury ship. An announcement attempting to calm the passengers blares over he digital screens, the Icarus is having difficulty with the hyperspace engines and has suffered substantial damage as a result of the dimensional displacement. The ship is being torn out of hyperspace when Tarver catches a glimpse of an enormous metallic object through the ship windows, large enough to pull the Icarus from her flight path. The panicked passengers being to surge into a riotous sea, fleeing to the escape pods when Tarver hears a distinctive scream and rushes through the crowd to save Miss LaRoux. No one on board could have predicted what was to come. For a moment the image before us is frozen. 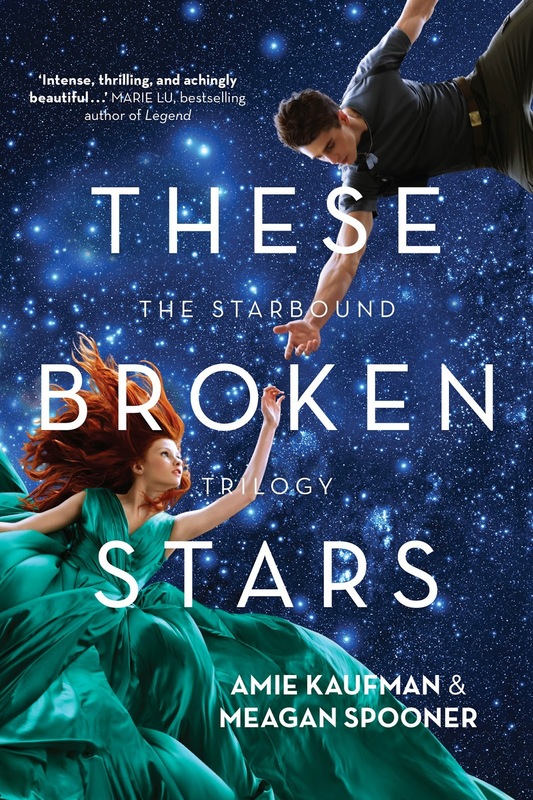 Our world, our lives, reduced to a handful broken stars half lost in uncharted space. Then it's gone, the view swallowed by the hyperspace winds streaming past, blue green auroras wiping the after images away. Until all that's left is us. The standard escape pod the unlikely pair have boarded is still firmly attached to the Icarus, and without Lilac's intimate knowledge of the ship the two would have perished. Rerouting the wires, the pod careers past the same reflective metallic object and tumbles towards an unknown planet. Lilac is battered and bruised, insisting they remain with the pod as their best chance of rescue, but Tarver is in his element. The planet has been terraformed, trees dotting the landscape with signs of plant life, and clean air. Still dressed in an evening gown and shoes that are impossible to navigate the rough terrain in, Lilac follows Tarver to explore the new world as pieces of flaming debris are falling from the sky. The Icarus is dying, her father's ship is in ruins, falling from the sky and heading towards her final resting place within the mountain range beyond the vast plains. Lilac worries what will happen to Major Meredsen when their rescue arrives, to be seen alone with the social darling could not only end his career, but his life. And for Lilac, it wouldn't be the first time. They need to make it to the wreckage site of the Icarus if they want any chance to be rescued, they'll need to walk for what could possibly be days, if they don't stumble upon a colony first. Already on edge with one another, they set off for the mountain range. Lilac is determined not to become a liability, but with strange big cats roaming the forest, they both walk with a weary unease. It isn't until they camp for the night, when Lilac hears the first signs of human life, whispers beyond the forest and a woman quietly sobbing. But there is no sign of anyone there, there are no rescue crafts in the atmosphere, and no other signs of life... Except for the whispers that plague Lilac. The voices are nothing more than muffled whispers, causing Lilac to shake and sweat through what Tarver believes are hallucinations as he can't hear the gentle and softly spoken words. Lilac knows the voices want to help them on their journey, guiding their way to safety. But as they approach the fallen ship, it becomes clear that there is something greater the voices are guiding them towards, but will they survive the new alien world until their rescue comes... If it comes at all. These Broken Stars was phenomenal. Rarely does a book lure me in so quickly, but it was simply perfection. Told in dual points of view, the illustrious Lilac, wealthy socialite and oppressed teen. She's the only daughter of a single parent, her over protective and controlling father having lost Lilac's mother years ago. He's wealthy, powerful and influential which is the reason why Lilac keeps acquaintances at an arm's length, including Tarver. Tarver is a simple boy that has returned from war as a hero. His new found status has thrust him into a vain and materialistic world. Two worlds collide when the Icarus hits trouble and the soldier and heiress learn to enable one another to survive. It's clear the annoyance with one another is fused with an attraction that neither of them cares to admit, but slowly a romance blossoms, a deep respect and mutual admiration forms between the two. I absolutely loved the fusion between science fiction, romance, fantasy and survival. It was intriguing, the storyline was unpredictable and kept me on the edge of my seat. Amie Kaufman and Meagan Spooner have created a completely seamless partnership, a beautiful yet dangerous world, a multitude of secrets and phenomenons and a romance that defies boundaries. These girls are utterly brilliant, I'd read their shopping list if they stuck a cover on it. I am reading this at the moment when they just landed after their escape pod and I must say, this book is amazing. I'm reading it more like a romance but I'm really enjoying the blend of sci-fi, adventure, romance and survival. Thanks for your review Kelly! Isn't it just brilliant Jeann. I love that each book in the series will essentially be another love story, different circumstances but all having the same enemy or villain in common.